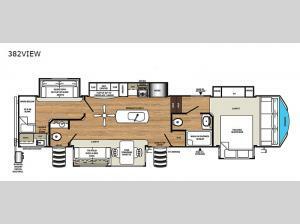 This Sandpiper fifth wheel is an outstanding unit that boasts plenty of exceptional interior living space! The five slides are what give this unit its ability to sleep nine people each night, and you will be impressed by the private master bedroom in the front because it houses two of those slides, as well as a large sofa. With a private bunkhouse in the rear and a full and half bathroom, you will be able to confidently host any of your friends and family for a weekend of fun at your local state park, and the kitchen island will make it easier to prep meals big enough to feed everyone.